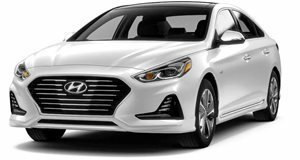 The Hyundai Sonata is a solid mid-sized sedan with a wide range of standard and available features, shoppers also have three different drivetrain options to suit their needs. The plug-in hybrid model offers potentially better consumption than the pure gas-powered cars while allowing for longer electric-only range than the standard hybrid models, making them a very efficient option for those whose commute doesn’t stray too far from a convenient charging point. Not much has changed for 2017 and the Sonata plug-in hybrid is offered with the same specification and engine options as last year. The interior of the plug-in hybrid shares its design and materials with the rest of the Sonata range, there is a decent amount of space in both rows although rear headroom is a bit restricted for taller adults. The large center touchscreen is easy to use as are the major controls which are placed logically around the driver. The trunk space is restricted by the larger battery pack and both the hybrid and regular Sonata offer more cargo carrying capacity. Most plug-in hybrids offer slightly more trunk capacity too. The Sonata offers a relaxed driving experience other than a brake pedal that can feel a bit too sensitive at times. The ride is soft and absorbs most bumps without complaint, as a tool for daily commuting the plug-in hybrid fits the bill. Enthusiastic driving is best left to the Honda Accord and Ford Fusion which offer a slightly firmer ride and more engaging handling around corners. For highway cruising, the Sonata is one of the quietest cars in its class and the solid build-quality means that you should not hear any rattles or noises when travelling in the silent all-electric mode. The powertrain for the plug-in hybrid consists of a 154 horsepower, 140 lb-ft of torque 2.0-liter engine (the same as in the hybrid model) and a 67 hp electric motor (which is more powerful and has a larger battery than the standard hybrid). This combines to make a total of 202 hp and the front-wheels are driven through a 6-speed automatic transmission. The immediate electric torque makes city driving a pleasure and there is enough power to merge onto the highway without any issues. The conventional automatic transmission also side-steps the sometimes whiny CVT transmissions that are fitted to hybrids. 0-60 mph takes around 9-seconds which is about average for the class. A range of 27-miles is possible on purely electric power if you drive extremely gently and this combined with the 39 mpg average fuel economy rating of the gas-powered engine yields a 99 mpge rating. This number is slightly below the class-leading Prius although in line with other similar sedans. The Sonata Plug-In Hybrid comes in two trim levels. The base trim is well-equipped and you get an 8-inch infotainment system with smartphone integration and navigation, hands-free trunk access, auto-headlights, rearview camera, leatherette interior, heated front seats, leather-wrapped steering wheel, 17-inch alloy wheels and power driver seat. Blind spot detection and rear cross-traffic alert are part of the standard safety systems and moving up to the Limited Trim gets you forward collision warning, lane departure warning, rear parking sensors, adaptive cruise control and auto-high beam assist. You also get ventilated front seats, memory settings for the driver’s seat, 6-way power passenger seat, HD Xenon headlights an Infinity Audio system and leather interior. The Hyundai Sonata plug-in hybrid is a competent offering that does not offer class-leading qualities in any one specific category but its overall capabilities make for an accomplished family car. The standard fitment of some desirable luxury and safety equipment as well as a smooth shifting automatic transmission (instead of a slurry CVT) will appeal to many shoppers as will the comfortable ride and roomy interior, although available trunk space trails most of the segment.